I have been using a PEPLINK 310 for the past 5 years. And just upgraded my connection speed and need to upgraded to hardware that can handle the speed. 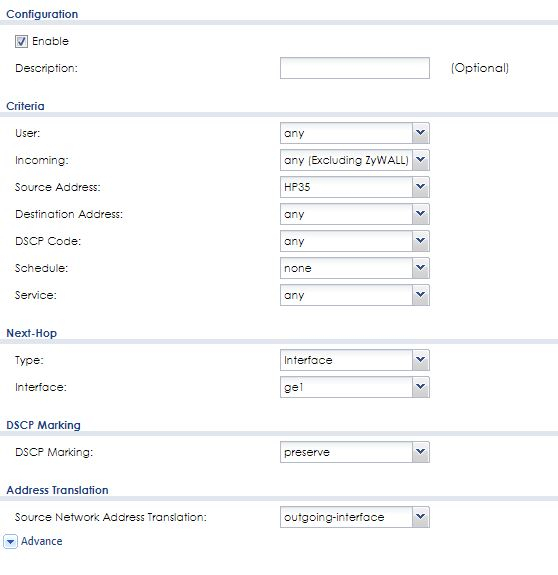 I purchased the Zywall 310 and for the life of me, can't force an outgoing IP address to use a specific WAN port. Do I have to have a schedule defined, if I want this all the time? Well, then from the policy route rule you set. It should translate the source IP of HP35 to ge1 interface IP and sent out from ge1. If all the WAN IPs are in the same subnet. Then you cannot assign it to different WAN port. The arp learning of default gateway ip address will make issues which flapping on different WAN ports. They are not in the same subnet. Well that was frustrating. But I believe the issue has been resolved. The PC in question, had two IP numbers assigned to the same card.